Follow Jordana Pakistan : Facebook & Instagram to Win amazing Giveaways. Hydrogenated Polyisobutene,Bis-Diglyceryl Polyacyladipate-2, Bis-Behenyl / Isostearyl / Phytosteryl DimerDilinoleyl Dimer Dilinoleate, Squalane, Polyethylene, Caprylic / CapricTriglyceride, Triisostearin, Diisostearyl Malate, Microcrystalline Wax (Cera Microcristallina),Trimethylolpropane Triethylhexanoate, Pentaerythrityl Tetraethylhexanoate,Polyamide-3, Disteardimonium Hectorite, Flavor (Aroma), Sorbic Acid, PropyleneCarbonate, Pentaerythrityl Tetra-Di-T-Butyl Hydroxyhydrocinnamate, Tocopherol,Calcium Sodium Borosilicate, Calcium Aluminum Borosilicate, Silica, Tin Oxide. +/-May Contain: Mica(CI 77019), Titanium Dioxide (CI 77891), Iron Oxides (CI 77491, CI 77492, CI 77499),Carmine (CI 75470), Manganese Violet (CI 77742), Red 6 (CI 15850), Red 7 (CI15850), Red 7 Lake (CI 15850), Red 21 (CI 45380), Red 27 (CI 45410), Red 28Lake (CI 45410), Red 30 Lake (CI 73360), Yellow 5 Lake (CI 19140), Yellow 6Lake (CI 15985), Blue1 Lake (CI 42090), Orange 5 (CI 45370). Candid Coral : An orange-y shade with a bit of pink. Tropical Frenzy : A bright fuchsia pink- like Sweet Pink. Terra Crave : A is a red-ish brown. 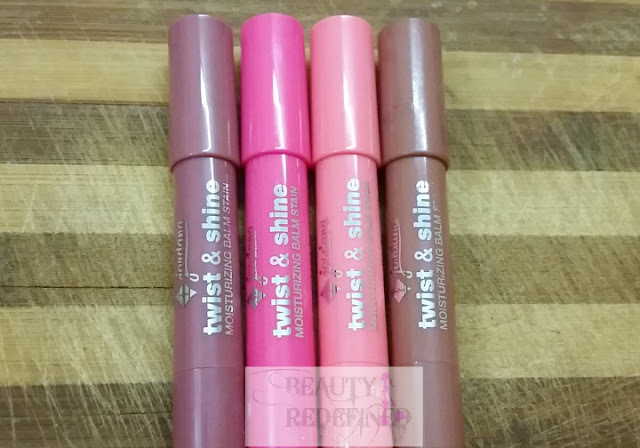 The texture of this product is smooth and totally moisturizing these balms does hydrate my super dry lips and keep them soft without being too heavy. Although it is really shiny upon application after a while these settle down to a less glossy finish with a nice flush of colour. They are light weighted balms and does not give you heavy or tacky feeling. The pigmentation of these stains are amazing and a single swipe with most of the shades are enough to get opaque color. They wear quite comfortably without migrating or feathering on my drier lips As they wear away they leave behind a very nice staining effect that lasts an extra two to three hours. They have fruity bubble-gummish flavor and scent that’s very subtle and since i am a sucker for scented products, I love the smell. Another great point about these sticks is they have a twist up design so no need to sharp the pencil over n over again. I have a collection of lipsticks that I hardly ever wear because I either find them too drying on my lips, too sticky, or I'm too lazy to keep re-applying after I eat/drink. But this has been my HG Lip product. It keeps my lips moist, has a nice feel and is easy to apply. After it wears off, my lips have a nice stain that still looks good. This is the only product for which I've bought multiple backups. Its that good! I have to get my hands on these, they sound great! I also have dry lips. Need to try these. Love that coral shade. 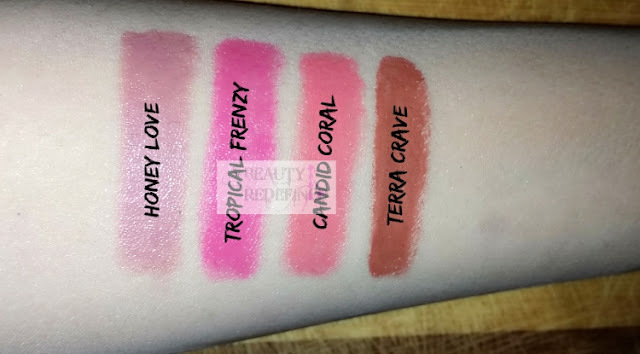 All the shades look aweosme....but my favorite are candid coral and tropical frenzy. They are looking extremely gorgeous. I loved all the colors especially the coral one.